Navigant Research has concluded that revenue from the global market for solar PV combined with energy storage nanogrids is expected to reach $23.1 billion in 2024. 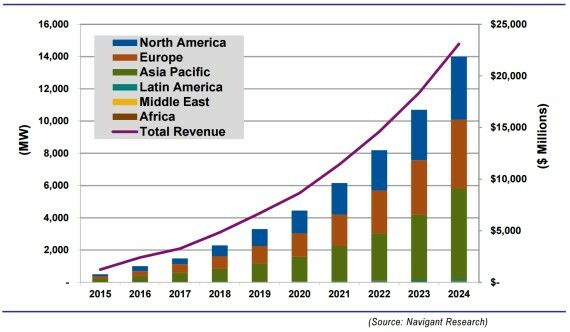 A new report published by market research and consulting firm Navigant Research has investigated the rapidly expanding market for solar PV systems combined with energy storage nanogrids, and determined that by 2024, revenue from this industry is likely to reach $23.1 billion, up from its current $1.2 billion in 2015. The solar PV plus energy storage nanogrid market is expected to be led by the three more developed world market regions — North America, Europe, and the Asia Pacific region. Europe currently stands as the world’s largest market for solar PV plus energy storage nanogrids, with an estimated 185.5 MW of new capacity additions in 2015 alone, which is expected to increase to 4,272.1 MW by 2024. The Asia Pacific region follows close behind Europe with an estimated 184.4 MW of new capacity additions in 2015, before overtaking Europe as the largest global market in 2016, and maintaining that lead over the forecast period, reaching 5,619.9 MW by 2024. North America will remain the third largest market over the forecast period, with 122.2 MW of new additions in 2015, growing to 3,918.2 MW by 2024. However, North America can rest solid in the knowledge that it is the clear leader for commercial PV plus energy storage nanogrids, accounting for around 80% of the global market over the 10 year period.